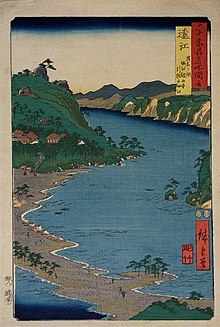 Tōtōmi Province (遠江国, Tōtōmi-no kuni) was an old province of Japan in the area of Shizuoka Prefecture. It is also known as Enshū (遠州). The province had borders with Mikawa, Suruga and Shinano Provinces. Tōtōmi was one of the original provinces of Japan established in the Nara period under the Taihō Code. In the Edo period, the Tōkaidō road was the main route between Kyoto and Edo. The road passed through Tōtōmi. Oguni jinja and Kotonomamahachimangū were the chief Shinto shrines (ichinomiya) of Tōtōmi. ↑ Nussbaum, Louis-Frédéric. (2005). "Tōtōmi" in Japan Encyclopedia, p. 990. ↑ "Nationwide List of Ichinomiya," p. 1; retrieved 2012-1-24. This page was last changed on 31 August 2017, at 14:07.